Why choose BENTLEY Marine Commercial & Military Division? The world leaders in Green Ship Technologies! Before you build or refit, talk to us and let us assist you with your Next Gen Smart GREEN Ship Project ! Custom Designed, not cookie cutters! BENTLEY MARINE Next Gen Commercial & Military vessels, Machinery & Equipment are custom designed, engineered and built to our customers specific requirements and needs. Our Next Gen Global Team bring the latest AI Technology in intelligent Ship Solutions for the most demanding applications. NOTE: In order to protect our proprietary technologies, it is our policy not to disclose floor plans or machinery arrangement before we sign an Initial Consultancy Agreement and meet in person with our customers to dicuss the project. BENTLEY MARINE Next Gen Commercial & Military vessels are built in selected associated military and commercial shipyards throughout the world. Construction and machinery installation are performed under our strict direct supervision and Total Quality Assurance Program. 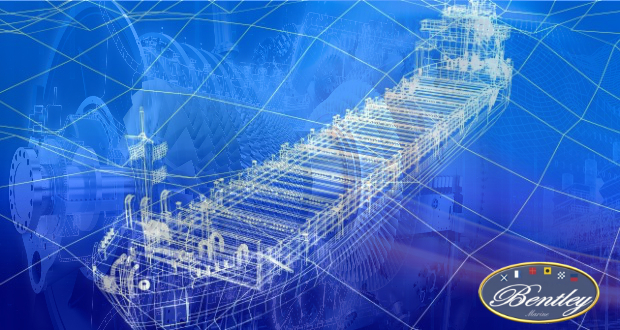 Our worldwide innovative modular shipbuilding capability gives our clients a new level of flexibility, dramatically reducing costs and delivery times. BENTLEY MARINE Commercial & Military vessels are AI engineered, laboratory tested and built to exceed the most strict Classification Societies safety standards and to withstand the worst possible operation conditions. Extensive use of light weight aerospace materials, fire proof engineering with integrated sprinkler system and full sound insulation throughout the vessel are just a few of the standard features that sets BENTLEY MARINE vessels, machinery and equipment apart from the competition. BENTLEY MARINE vessels, machinery and equipment are also carefully designed and engineered to last longer and to be very low maintenance. The latest construction materials and techniques are employed, such as the use of exclusive military-grade special metal alloys and composites. Our lightweight BENTLEY Marine Aluminum Magnesium and Titanium Alloys are best for salt water corrosion resistance and our Next Gen Advanced Composite Materials are reinforced with fhybrid fabrics stronger than Kevlar and Carbon Fiber. 100 years ago, BENTLEY SHIPYARD in Jacksonville was already in the cutting edge of Technology building Composite Concrete military ships of 420ft. Today BENTLEY MARINE continues to be the World's First to innovate with the construction of large and very large Cargo ships and military ships with robot laser-welding technology utilising GREEN recyclable engineered polymers that are stronger and more durable than steel. This exclusive BENTLEY MARINE proprietry technology opens a new era in shipbuilding construction with alternative corrosion free materials that replace traditional steel construction for large commercial and military ships. Next Gen Fire Resistant Super Strong Concrete Composites. BENTLEY MARINE is the world leader in Advanced GREEN Ship Technology. In addition to work with all top tier manufactiurers to integrate innovative solutions, we also package our own brand of custom built machinery and equipment, such as lightweight aluminum Diesel engines, compact gas turbines and gear boxes, mini turbine generators, motion control and electrical systems. Some BENTLEY MARINE Commercial & Military vessels are built over patented military or aerospace developed Advanced Hulls. 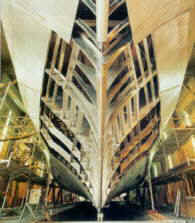 These special hull forms employ computerized motion control systems that enable them to perform in the worst possible sea conditions and yet provide a silk smooth comfortable ride, thanks to the extensive use of exclusive resilient floor systems, wall insulation and BENTLEY MARINE vibration free machinery that combined provide a whisper quite environment. Some of the hull designs, such as A-foils, Air Cavity, Wave Piercing Trimaran and hydrofoils, enable a vessels equipped with relatively small diesel engines to sustain high cruising speeds over 40 knots in adverse sea conditions with great fuel economy. When equipped with BENTLEY Marine high-efficiency gas turbines, they can reach breath taking speeds over 70 Knots. The purchase of a commercial or military vessel, machinery and equipment is an important decision and we guide our customers in every possible detail to make their money worth and their business or Navy even more advanced. BENTLEY MARINE offers a Global around the clock warranty and service support. Service on any part on the vessel is just a call or e-mail away. No more hassle of calling several local service distributors. With one Centralized number to call our Global Team will be on their way to make all the necessary arrangements to service your vessel ASAP. Generally in less than 48hs. Extended warranty plans of up to 5 years can be purchased in accordance to your specific needs.